[Call Cost] When a "Duel Sieger "Spartand"" on your field is destroyed, nullify the Lifelink of "Duel Sieger "Spartand"". & Pay 3 gauge. His victory is assured, even when going up against the entire galaxy. [Equip Cost] [Pay 1 gauge]. A sun burns brightly in everyone's hearts. King of Knights If you have four or more different <<Dragon Knight>> in the drop zone, this card gets power+4000 and defense+4000! [Counter][Act] You may discard a <<Wild Dragon>> from your hand. If you do, use one of the following abilities.• Pay 2 life, and for this turn, the next time this card would be destroyed, this card remains on the field!• Pay 2 gauge, and nullify your opponent's spell. Nightmare in extreme colors, incarnation of destruction. [Act] If you have a size 3 monster on the field, you may discard this card from your hand. If you do, put two cards from the top of your deck into your gauge. Look up, and happiness shall descend upon you. Evil Crusher, Steel Dragon Barrage! [Cast Cost][Pay 3 gauge]You may only cast this card if you have a size 3 monster on your field, and your opponent has no monsters on the field.Deal 4 damage to your opponent!! Down with injustice, destroy all evil!Powerless justice is just plain nonsense! [Cast Cost] Pay 2 life.Draw 2 cards. You can only cast "Divine Dragon Creation" once per turn. Advice! You do not be afraid to pay a life!Cards drawn give you more power than the life you lost! You will learn more from defeat than victory. 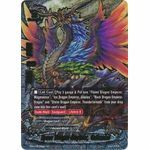 [Cast Cost][Pay 6 gauge]You may only cast this card if you have eight or more <<Armordragon>> in the drop zone, and you do not have a monster in the center.Deal 5 damage to your opponent! With the aid of noble spirits, strike the enemy with blasts of lightning! 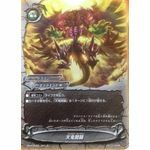 [Call Cost][Pay 3 gauge]When this card enters the field, you may choose a <<Demon Way>> from your drop zone and put it into your hand. If you do, choose up to three cards from your opponent's drop zone, and put them on the bottom of your opponent's deck in any order.